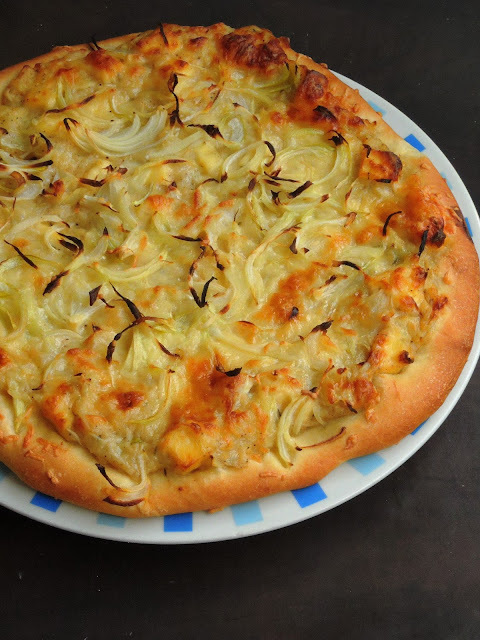 If you are bored of usual tomato sauce based pizza, then you have to give a try to this fantastic fusion Paneer pizza. Whoever think that pizza without tomato sauce is not a pizza then they should give a trial to this alluring white pizza. Basically white pizza is typically covered with ricotta and mozzarella cheese instead of tomato sauce, anyhow it might also be topped with garlic, vegetables, alfredo sauce or simple bechamel sauce. Though cheese are overloaded in this white pizza, you can also add some chicken chunks or paneer cubes to skip the addition of grated cheese. However my today's post is cheese overloaded fusion pizza prepared with homemade pizza dough, homemade white sauce, paneer cubes and chopped onions. Yes i went with homemade stuffs instead of grabbing store bought dough and sauce. Am running this week's blogging marathon with Pizzas as theme, obviously this week's posts are going to be some fantastic pizzas. Pizzas are my kids favourite and they can have pizzas everyday without any guilt. Obviously when i picked pizzas as theme, i definitely looked for some different and unusual pizzas i have never baked at home. Hence this white sauce paneer pizza aka fusion paneer pizza. 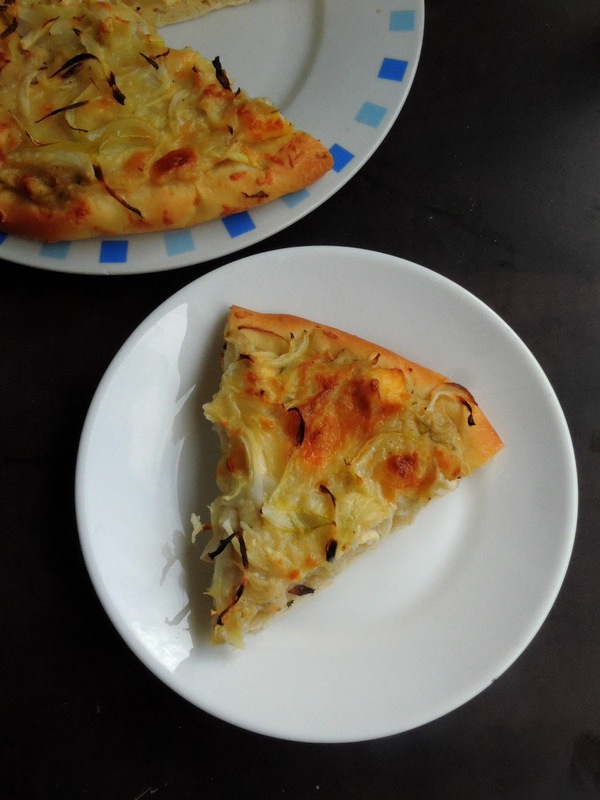 I always prepared pizza with tomato sauce and i was bit skeptical when i planned to bake this white pizza, but trust me everyone at home enjoyed thoroughly and kids went crazy. Seriously this white pizza is one of the best pizza i have never baked till now. Mix the flour, yeast, and salt in a food processor. With the motor running, add enough warm water (about 1 and 1/4 cups) to make a soft dough that rides the blade. Process for 45 seconds. Add a little water if the dough is dry or a little flour if it is sticky. Lightly oil a bowl, place the dough in it, shape into a ball and wrap. Let rise at room temperature until doubled, about 1 hour. Heat the milk in a saucepan, bring it to boil and put off the stove. Heat the butter in a heavy bottomed saucepan on low heat, until butter completely melts, add the flour slowly and keep stirring constantly to avoid any lumps. Once after all flour has been added up, keep stirring. Keep the flame in low. Keep stirring and let it cook for couple of minutes. Add the milk slowly and steadily into the butter flour mixture while constantly stirring. Add salt and spices. Mix well. Keep stirring on medium heat until it thickens up a bit. Switch off the flame. Punch down the dough and divide the dough as three balls. Roll the dough as medium sized circles. Meanwhile, preheat the oven with a baking stone in it to 400°F. Add the paneer cubes to the bechamel sauce. Spread generously the bechamel sauce with paneer on the rolled circle. Top the sauce with chopped onions and grated cheese. Bake for 15-20 minutes until the crust turns brown. Slice and enjoy warm. 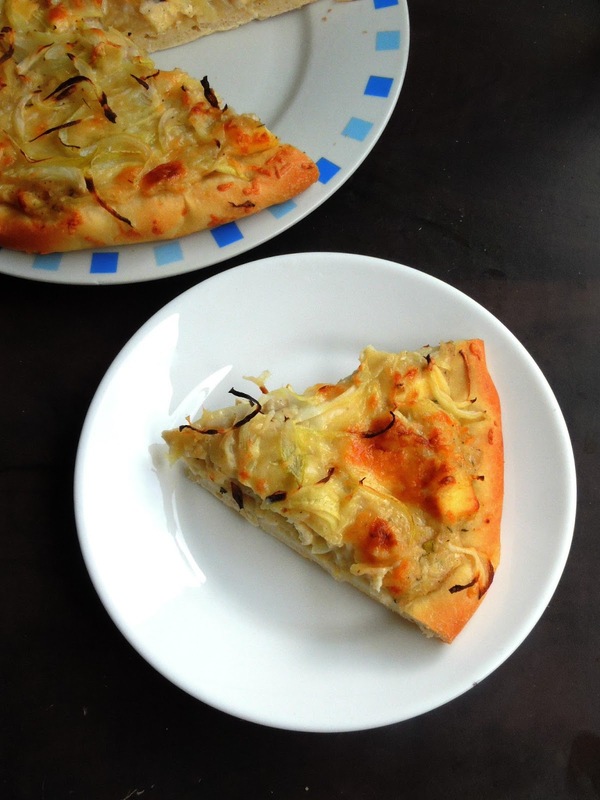 White sauce pizzas taste awesome , Paneer of course is a wonderful topping , and this pizza looks fantastic . Fantastic pizza Priya, what an awesome looking pizza you got there! Yummy Yummy pizza. looks delicious. White sauce sounds perfect topped with the paneer pizza. Bookmarking to try it later. That is a great pick Priya! I have never made pizza with white sauce yet and this definitely is going to my bookmark list. White sauce on pizza is new to me. This looks so yummy I can just goggle it off.